I updated my demo reel a little bit, and kicked out some old stuff out of my reel. Hope I could get some good feedback at Siggraph.. There is a siggraph 2002 paper talking about how the ILM uses “Reflective Occlusion” and “Bent normal” techniques to generate fast and reasonablely accurate fake GI passes for light. This shader set up makes sure we are using “reflective occlusion” instead of ambient occlusion. Then, it comes to the bent normal part. The goal of using this technique is to get a flexible fake GI pass (or indirect light pass) based on the given environment image. 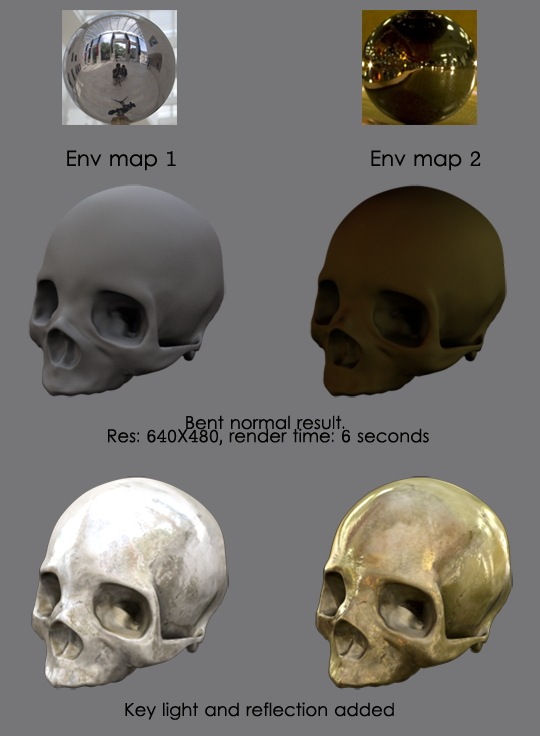 a. Bake(use mib_lightmap_write) the ambient occlusion into texture, before that we need to UV the geometry properly , in my case is the skull model, without too many overlapping areas. 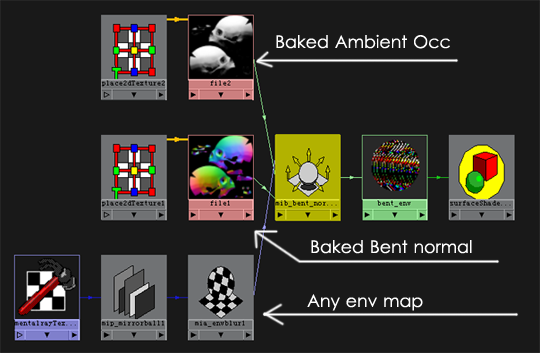 b. Bake(same as “a”) the bent normal into texture, just change the mode from 0 to 2(world space ) or 3 (object space) in the mib_amb_occlusion shader. 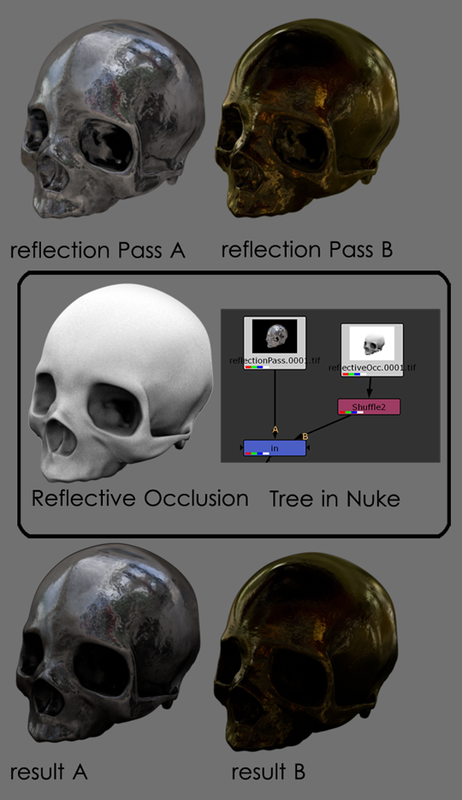 In the siggraph paper, mighty ILM people were using customized Renderman shader to generate the reflective occlusion, baked AO and bent normal, and shader to use the baked textures. I tested with Mib_ambient_occlusion instead, but the whole idea is pretty mucn the same. Be to noticed: this technique is not suitablt for a deforming object, and dramatic camera movement may also cause problem because of the baked textures. Originally I did this test just for a fake GI test for a student film project I am working on. But I also had fun while was playing this, which is important ^____^. You are currently browsing the Ling’s Blog blog archives for July, 2009.